Our Mini Burble and Marling installations merge cutting edge technology and creativity to bring immersive and interactive experiences like no other to your audience. Presenting Mini Burble here at Salford Quays, home to MediaCityUK, was a real highlight in 2015. Audiences really responded to the interactivity of the artwork and it’s beauty. We deliver an international programme of Digital Art and Umbrellium fulfilled our high expectations in every way – truly spectacular. 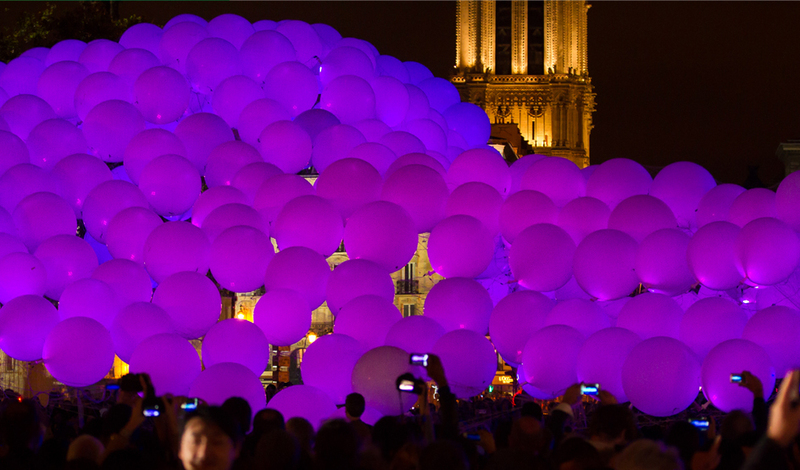 Mini Burble is a 10-story, interactive light installation comprising hundreds of balloons equipped with LEDs that illuminate the skyline. There are two ways that audiences can participate in the spectacle. The intuitive Mini Burble App enables them to paint the sky by tracing their finger across a scale model of the installation on a smart device. The Twitter Paint system is responsive to brand as well as the audience. After creating a bespoke hashtag, a simple Tweet with a choice of colour will trigger the transformation of the structure into a myriad of patterns – #YourNameminiburble Green. 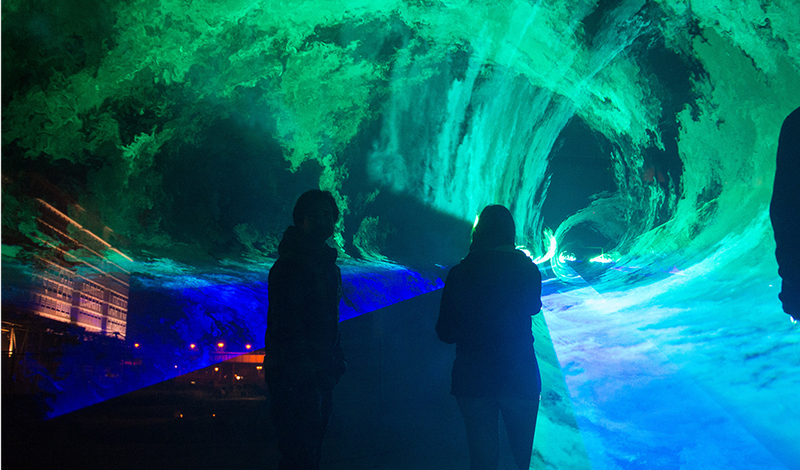 Marling is a voice-activated laser installation that creates spectacular effects which cling to the environment around it. Expertly designed for mass participation, complex 3D structures are revealed as an ever-changing aurora that reacts to the audience. The custom-built software, which makes Marling do what Marling does best, feeds off the frequencies of voices, movements and musicians and provides a collective sensory experience that can amplify the ambience of events, festivals and public spaces. 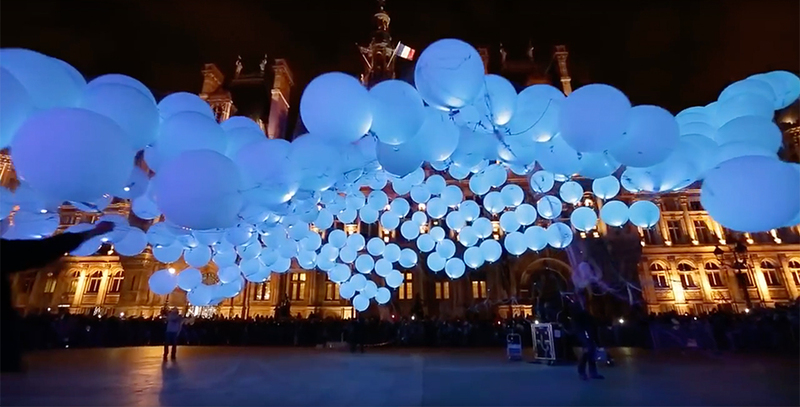 The Mini Burble structure comprises of 300 x 36” balloons each housing bespoke LED light technology inside the balloons, and connected to a mobile server box at the base of the structure. The balloons are held in place with a custom net built with a tether rope system that is used to fly, drive in the correct direction, slow down and to lower to the ground the Mini Burble. The Mini Burble App can be installed onto Android tablets supplied by the booker and allows up to 10 people at a time to paint the Mini Burble. The installation requires 6 x 13 amps power outlets for general use. Marling consists of a laser projected over the heads of the crowd from two small shipping containers, one on top of the other. The top container houses the projecting laser and acts as the operating room, whilst the bottom container is used as storage. Fog machines are placed throughout the event space, producing a significant amount of fog that rises up into the laser light projection path revealing the sound reactive 3D laser structures. 6 x 13amp power outlets are required inside the containers & the event space must have a number of power distribution points. Mini Burble is approximately 26m high x 14m wide, once deployed it is 30m at its highest point. The event space needs to be a minimum 50m x 50m and be clear of structures and street furniture, e.g. lampposts or bus shelters, to a distance of 100m. Marling requires a minimum space of 100m in width, which must be accessible at night and without obstructions over 3.5m high e.g. trees, lampposts or bus stops. It is recommended that the event area is not residential to avoid laser light being unexpectedly projected through windows. Below are some videos where you can see Mini Burble and Marling in action! The 100 storey sculpture made of 300 LED lit inflatable balloons came to Salford Quays for 5 nights in July, located in the heart of MediaCityUK. The Umbrellium team were joined by Boy Blue Entertainment, who led a troupe of 50 dancers from across Greater Manchester in a dance performance inspired by the Mini Burble sculpture. The Mini Burble App enables the public to ‘fingerpaint’ and trigger animated colours, creating vivid patterns across its surface. Visitors can paint on their own, but if they coordinate and work together they are able to create more spectacular results. Marling is a mass-participation interactive urban spectacle, sited in a public square in Eindhoven, Netherlands, brought to life by the voices of the public. Your voice creates the space around you, reverberates in many ways long after you have stopped speaking. In Marling the voices of citizens are given form through spectacular effects that hang in the air above the crowd, forming a delicate, intricate ceiling of animated colour.